Every year I set the goal that I will finish more of my WIPs (works in progress) yet I still have an ever growing pile. This year I’m going to get really serious because it’s getting out of control. This year I’m going to Save the UFOs (unfinished objects). Last year I posted about knowing when to call it quits on a project and I abandoned a blanket that’s been in my pile for years. I feel like everything that’s left in my UFO pile are all things I really want to finish, I just have gotten distracted by other things. 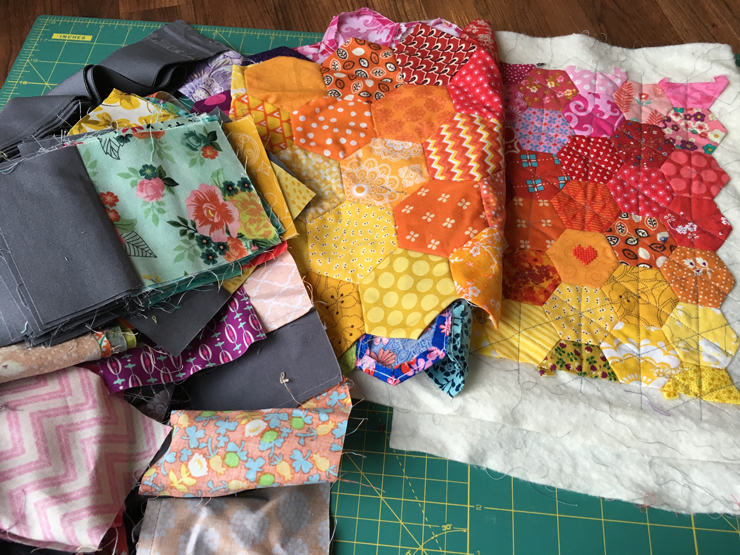 Mollie at Wild Olive posted this week about Making Old New Again and tackling WIPs based on how much you have left. This is a really good idea because some of these are pretty close to being done, I just got distracted by something else I wanted to make (#projectstartsanonymous) or got to a point where I wasn’t sure what to do next and I got intimidated. I might be forgetting some, but I’m got to show off my UFO list. The whole, embarrassingly long list. And I’m not even counting the projects I’m actively working on right now. I’m warning you, multiple people have told me that my WIP list stresses them out. Basically done, I just need to weave in the ends. This is probably going to be the first thing I tackle because it’s really ridiculous that I haven’t done this yet. This is maybe done being pieced but I need to pick a pillow size and see. I’m listing this separately because it’s in the same boat about needing to know the final size, but it’s still a lot further away from being done. If you follow me on Instagram you have noticed I’ve been a bit obsessed with making these raspberry kiss blocks. 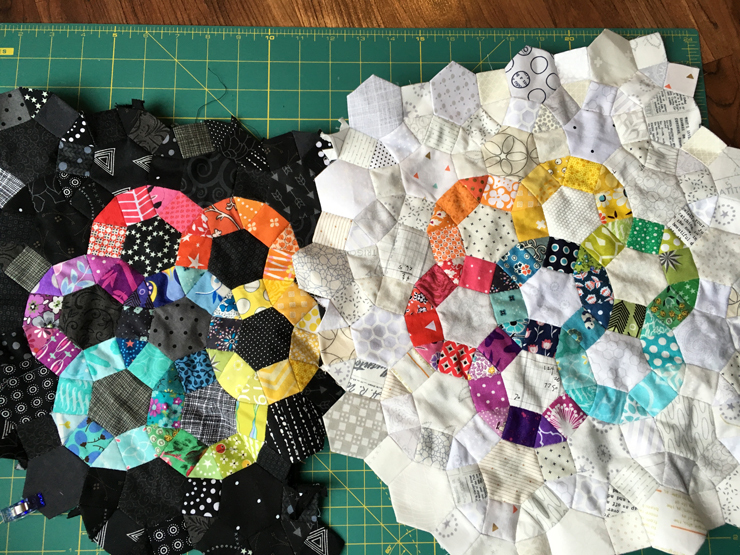 I’m making a quilt with blocks of both sizes and white backgrounds, and then I made blocks with a black background for a pillow top. I got all the blocks made in a couple days and now they are just in a pile waiting to be trimmed and assembled. It won’t take that long but making more blocks is so much more fun. This isn’t going to be finished anytime soon but I’m putting it on the list. I need to do some math and set a goal for making a certain number of these a week so I can stay on track for my 2018 finish goal. You can read more about this project here. Cloud 9 sent me some of their adorable Knuffle Bunny fabric and I made a quilt with it that’s amazing and I love it. And it needs to be quilted and finished. Same as the last two. Except this one I got as far as basting it but I wasn’t happy with how wrinkled the back fabric was. I need to take another stab at it before I start quilting. 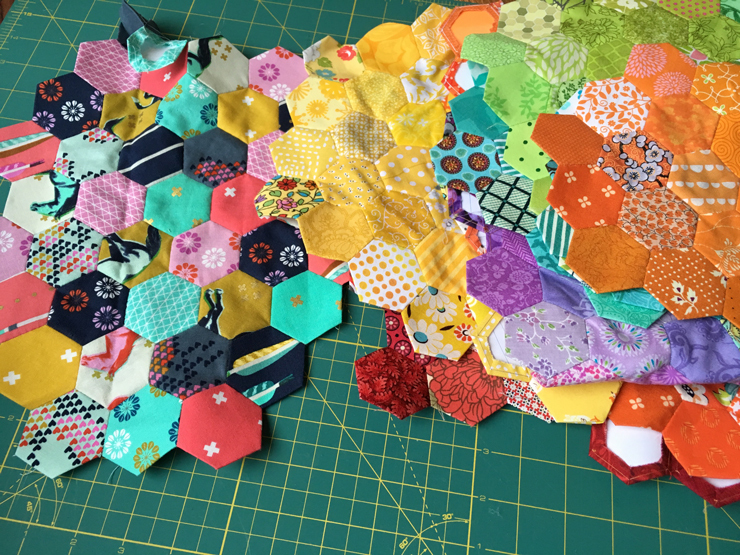 I have a big hexie panel I’ve been making with a Cotton + Steel charm pack. I love how it looks but I have no idea what to do with it. It was originally going to be a pillow but then I went and started 3 others and I just don’t need that many pillows in my life. So I occasionally add some more hexies and wonder what I should do with this thing. This project just kind of got pushed aside and I barely picked it up all year. I had originally planned on a full size quilt and I think I’m just going to scale it down and try to finish it. I made an EPP Triforce that I intended to make into a DS case for Josh. And then he traded his DS XL for the smaller one and then things got confusing with the measurements and I just kind of put it aside. I need to make a prototype and then just get this made. 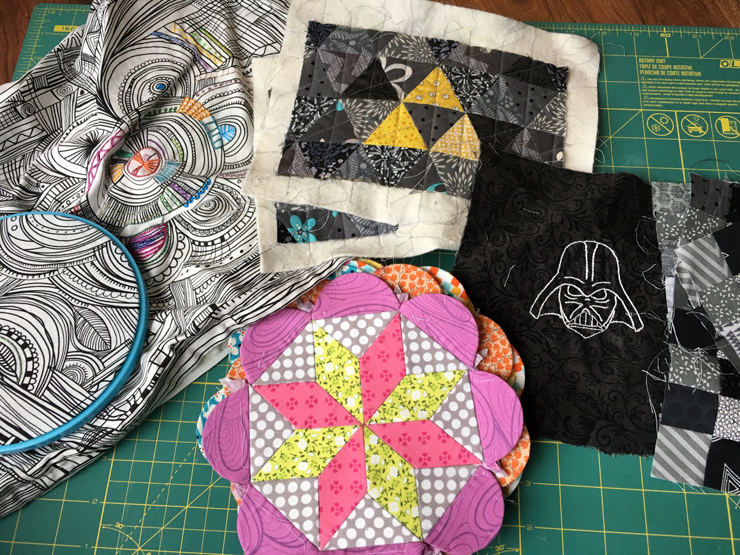 When Diane from CraftyPod first released her FlowerPOW mug rug pattern I went crazy and made a ton of them. Three I’ve given as gifts and then I have another FIVE that I have pieced together and just need to cut backing felt and then finish. Remember years ago when I was working on a doodle stitching pillow? No? Yeah I didn’t remember it either… I unearthed it and want to just finish it up and be done with it. This was one of the first EPP projects I ever made and then it’s just been sitting in a pile. I removed all the papers and kind of regretted it because I couldn’t finish it the way I originally intended. I think I’m just going to attach it to a felt back and be done with it. This is the same as the Darth Vader case, I just need to figure out the sizing. So there you have it… The insanity that is my UFO pile. This year I want to start really knocking some of these off my list which is why I’m making my shame public. 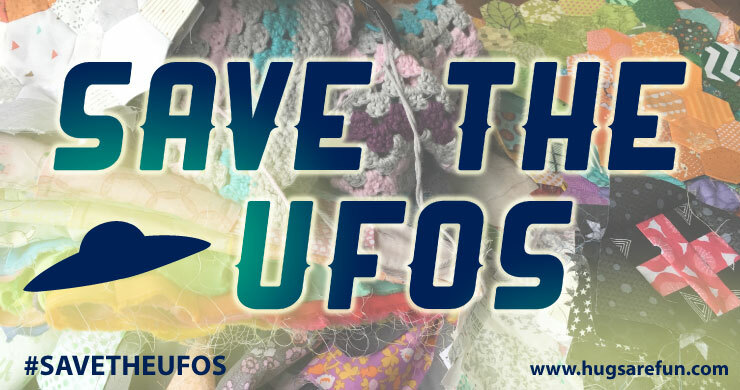 Feel free to join along on Instagram with #savetheufos There is also a 2016 Finish-A-Long taking place if you wanted to play along with that too! So tell me, how many UFOs are on your list? Hopefully there is someone out there with a longer list than mine. You have a lot of fun colorful projects to choose from. 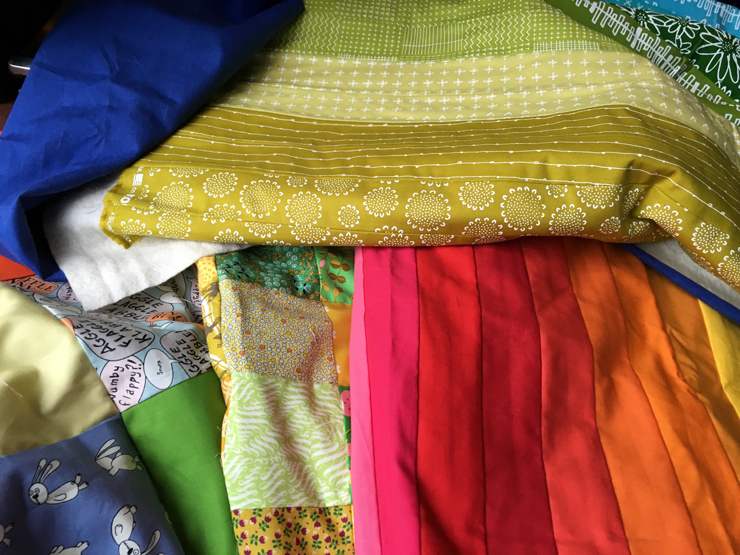 My list has TWENTY EIGHT quilts on it, plus two garments for my kids. :-} This includes a number of projects that are older, including one I started in 2004. I find having the long list is really helpful to staying organized/focused. Which one(s) are you going to work on first? I think I’m going to tackle a few of the smaller ones that I can finish quickly. Good luck with your list! Our local shop had a ufo challenge…..my list is up to 96!!!!!!! Now THAT is out of sight! Have so far reduced it by 30 in two months…..but I still keep finding more ufo’s as I dig out! ACK!! Oh my goodness! You’ve officially made me feel better. But finishing 30 in two months is very impressive!